What's going on at Epcot? The Millennium Celebration begins October 1, 1999 and continues until January 1, 2001. The event can be compared to WDW's 25th Anniversary Celebration in terms of size and scope. 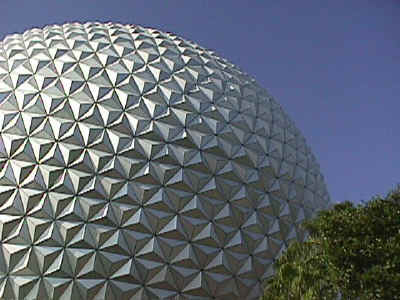 Epcot will be the host location, with most of the events taking place within the park. This is a preliminary list of the changes to our favorite park, some already started, and some which will be undertaken this Summer. This list is by no means official - the information has been collected from Disney press releases, Cast Members, and general rumors. Changes are listed in the order you would encounter them as you walk through the park. The parking toll booth area is scheduled to be rehabbed with a new look and the removal of most 1982 cladding and signage. The parking lot repaving and realignment was completed in 1998. The entire area is supposed to receive a complete rehab, with new signage and a more modern look. A proposed "Legacy Walk" will be much like the Magic Kingdom's Walk around the World, only with metal or aluminum plates instead of bricks. The ticket booths recently received a new coat of paint, so it looks as though they will stay pretty much the same. The entrance plaza in front of Spaceship Earth will be closed all Summer long while these marble sculpture-things are built to replace the old gardens. The fountain has been removed, including the plexiglass sculptures. Update: Thanks to Dave, below is an imagineering concept drawing of a giant (we're talking 150 feet!) 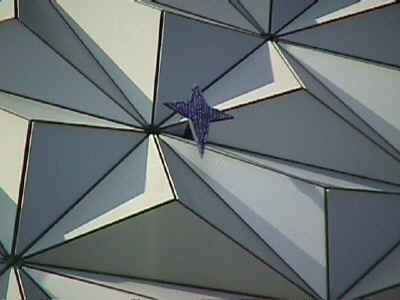 Mickey hand and wand reaching over Spaceship Earth. So I suppose the rumors are true! BTW, that's Marty Sklar, Imagineering boss, in the foreground. As of mid-Summer, a huge mass of blue steel framing was sitting in the east parking lot being constructed, presumably to position beside Spaceship Earth when ready. It looks to be about 140 feet tall. The plans are to cover the entire Innoventions Plaza with a cable and canvas 'tent'. The rigging is already done, and most of the cables are being put in place. The material will be blue or purple and will look like a chess board as opposed to a full cover. Under the dome, displays and stages will be set up. This will presumably be the headquarters of the Celebration, and where the Opening Ceremonies will take place. The Opening Ceremonies have been described as near the scope of the Olympics opening, with hundreds of performers, original music, and special surprises. Replacing the current jets in the Fountain of Nations is a rumored possibility. 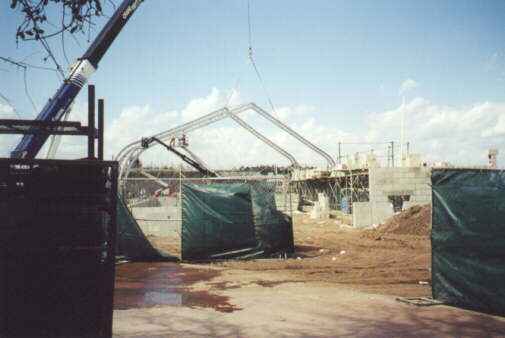 As of late 1998, preliminary work was being done on the area, with the entrance to Innoventions West removed. A new Centorium will take over all of Innoventions East, South side. The new store will apparently be the largest in-park merchandise location at WDW. The Epcot Outreach/Discovery Center was closed to make room for the expansion. As usual, new exhibits will be continually added to both sides of Innoventions, since there is still a large amount of unoccupied space, including a theater, I believe. Horizons closed January 9, 1999. However, the pavilion has remained mothballed, and untouched. That leaves the possibility of re-opening the ride during peak times, or even rehabbing the original ride for the Millennium. Disney claims it will not reopen, and they are imagineering a new concept. The catch is that a corporate sponsor is needed before any work can be done - GE's departure was the reason Horizons closed in the first place. Intel and Boeing are rumored to be interested. The pavilion will have a space theme, and possibly use the two OmniMax screens from the ride (which actually hold the building up) as a simulator experience akin to Back to the Future or Star Trek: The Experience. Now that the ride is operational, work is being done to improve reliability and capacity. Hopeful it will be up to spec by Oct. 1. Since closing in the Fall of 1998, the former imagination ride building has been gutted and construction is continuing on a new attraction. Possibly using the old ride system (with some improvements so the cars don't always hit each other), the new ride will take guests through a child's imagination. Themed as a part of the Imagination Institute (from HISTA) the new ride will keep Figment, but ditch Dreamfinder. The Image Works area upstairs will be converted to a display area much like the new Camera Center in MK, with Kodak Image Technologies. Opening is scheduled for October 1, 1999 with CM soft openings in late Summer. Main tank renovations of the shell base and filtration system were completed in 1998. Coral Reef Restaurant renovations completed 1998. A parade will wind its way around the promenade twice daily. Featuring performers from each country, Epcot entertainment performers and larger-than-life figures, with a new original soundtrack. Also, installation of huge torches around the promenade will be done this Summer, illuminating the promenade with something a lot nicer than those awful light towers. Most of the bases for these are in place (they sit in the water) and at least one torch, with a medieval-look, is erected and operational. Illuminations 2000 (or something similar) will debut October 1. The likelihood is that the current show will go down in June to allow construction of the new performance. Testing has been ongoing since Summer 1998, when selected effects were tested before park opening or incorporated into the nightly performances to gauge effectiveness. Effects included a barrage of very loud explosions, increasing in frequency to a crescendo - known as the 'big bang'. Another effect is huge fireball which is supposed to rise into the air and then explode. The old rusty barges will be destroyed (shouldn't be too hard), and a new soundtrack will be recorded. Four new anchors have been built in early 1999 around the lagoon for the new show. Backstage, behind American Adventure, work is proceeding on the Millennium Sphere, a large object that will presumably be the centerpiece in the new show. El Rio del Tiempo will close shortly to be reopened with a new theme. The boat ride will be taken over by the Three Caballeros with new sets, animatronics, and effects and will presumably open in time for the Millennium Celebration. A Biergarten rehab has been planned and budgeted for years now, maybe 1999 will be the year Germany foods finally gets their funding. The plans call for a marche-style German market, with individual stations in a market atmosphere. Although not part of the Millennium Celebration, this Summer Michael Flatley's Lord of the Dance will be performed four times daily with a four-month run. A new Millennium show will debut October 1, 1999. New film? Le Cellier was renovated in late 1998 and is now open. A new merchandise location selling Roots apparel and accessories is open. The Refreshment Port restrooms will be rebuilt to accommodate the increased traffic from the new pavilion next door. Update: Rumors from the Canada pavilion are that McDonalds may be involved in a Port rehab. "Would you like fries with that?"